From the spring of 2019, a further 110 natural gas-powered MAN Lion’s City low-floor buses will be driving around the streets of the Polish capital of Warsaw. MAN Truck & Bus Polska was able to win the order of 80 natural gas buses from Warsaw bus operator MZA at the end of June. The order involves the purchase of 50 articulated buses and 30 solobuses from the MAN Lion’s City CNG range. Another 30 gas buses are to follow a short while later, meaning that a total of 110 new Lion’s City CNG buses will be starting their service in the Polish capital at the start of 2019. “This is the largest purchase of low-emission buses in the history of our city’s bus company. There are currently 35 gas-driven buses driving around the capital; in the coming year, the number will increase by as many as 110. Environmental protection is our main priority and so we are already planning the next purchases. In 2020, more than 300 gas and electric buses will then be on the road for the city’s bus company,” said Renata Kaznowska, Deputy Mayor of the city of Warsaw. “The acceptance of our offer demonstrates the excellent collaboration that unites us. It also confirms that the MAN buses in the fleet of MZA, the city’s bus company, have proven themselves to be a reliable means of transport in the local public transport system,” added Jean-Sylvain Delepaut, member of the executive board at MAN Truck & Bus Polska. 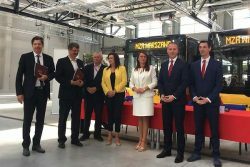 All of the ordered buses will be built in the MAN plant in Starachowice, the MAN competence centre for city buses. In line with the standards of the Warsaw transport association, the buses will have ticket machines, air conditioning, video surveillance and electronic displays on the inside and outside. The most important distinguishing feature, however, is the environmentally friendly and economical gas-powered drive. Such buses can also be driven with refined biogas (renewable natural gas / RNG/ biomethane) without any technical modifications, meaning that they are almost CO2 neutral. MAN’s current gas-powered bus range includes 12-m-long solobuses and articulated buses 18.75 m in length with a low-floor chassis and lowered entrance. Lion’s City GL CNG won the “Bus of the Year 2015” award and recently had an average market share of 39 percent. Over one fifth of the city buses sold by MAN in the past year run on natural gas.